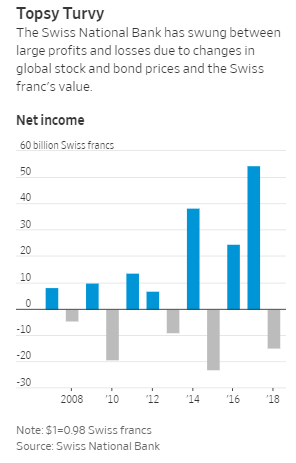 ZURICH—One year after posting a record 54 billion franc ($55 billion) profit, the Swiss National Bankswung to a 15 billion franc loss in 2018, as a double whammy of weaker global equity markets and a stronger Swiss franc eroded the value of its massive holdings of foreign stocks and bonds. The valuation loss reported Wednesday by the SNB underscores the interplay between central banks and markets. Usually, it is central bank decisions, or hints of changes in interest rates and other policies that cause stock and bond markets to fluctuate. But this has worked in reverse for Switzerland’s central bank, whose finances are largely at the mercy of financial markets beyond its borders. What sets Switzerland apart is that after years of currency interventions by the SNB—creating francs to purchase foreign stocks and bonds in a bid to weaken the franc—the bank has amassed over 700 billion francs worth of foreign assets, an amount that exceeds the country’s entire gross domestic product. This makes it a major asset manager in addition to being a central bank. 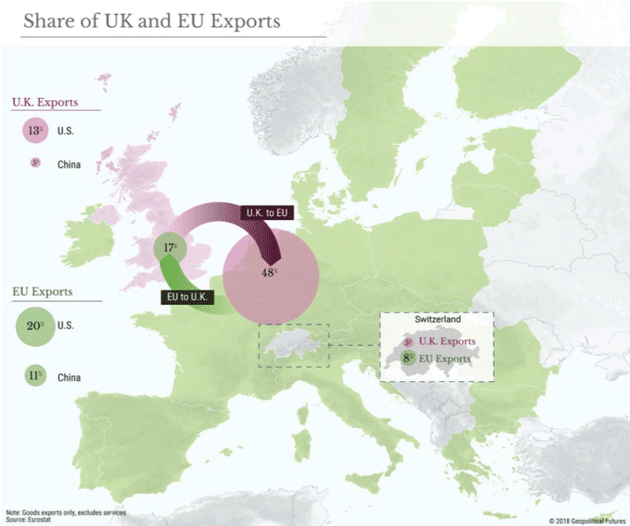 “In terms of absolute numbers you have these high swings, but that comes from the huge size of the balance sheet and foreign exchange reserves,” said Alexander Koch, an economist at Raiffeisen Schweiz bank. This included over $3.5 billion in Apple Inc.shares at the end of the third quarter, according to Securities and Exchange Commission filings, $2.6 billion in Amazon Inc. stock and $2.7 billion in Microsoft Corp.The SNB’s equity investments—which comprise 20% of its foreign assets—replicate broad indexes. The rest of the SNB’s foreign-reserve portfolio is in foreign bonds. Euro assets comprise the largest share, followed by the dollar. The euro fell 4% against the franc last year, as economic and political uncertainties lifted demand for the Swiss currency, which is typically seen as a haven in times of global stress. The dollar was little changed against the franc over 2018, but has weakened in the past month. Unlike other asset managers, the SNB can’t hedge its currency exposure, because doing so would undercut its efforts to weaken the franc. Given that limitation, “they’ve done quite a good job,” said Mr. Koch, and the 15 billion franc loss only represents about 2% of the bank’s roughly 800 billion franc balance sheet, including gold holdings. The good news for the SNB is that it can ride out market volatility, and its loss doesn’t affect its ability to carry out monetary policy. Annual Swiss inflation was just 0.7% in December and with the franc still strong by historical measures, the SNB isn’t under pressure to sell its foreign assets to strengthen its currency. It is expected by analysts to keep its key policy rate at minus-0.75% at least until late 2019. It wasn’t that long ago that oil-producing countries were riding high. 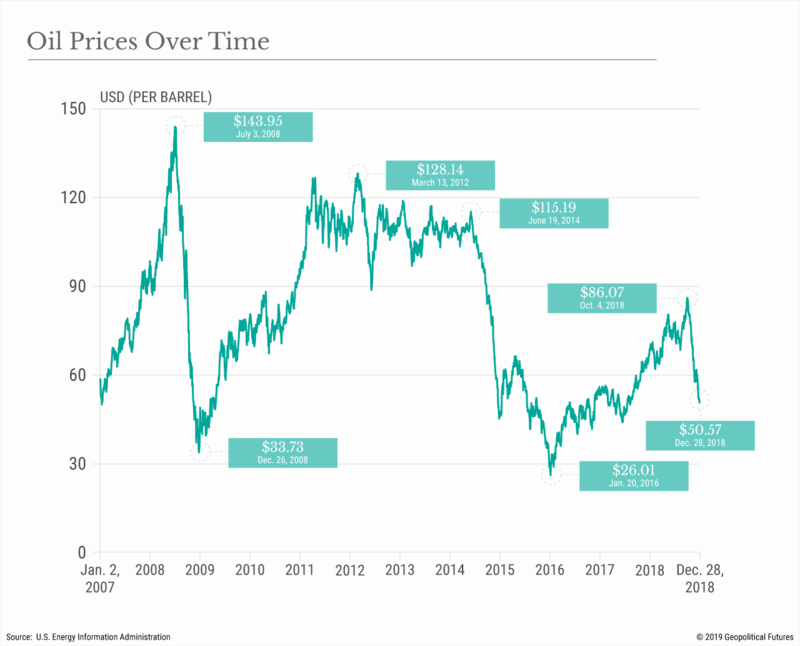 In 2014, with prices topping out at $115 per barrel, producers the world over had money to save, money to spend, and money to reinvest in what seemed to be an increasingly lucrative industry. Black gold, it seemed, brought their budgets into the black. But circumstances changed, and a year later oil prices fell dramatically, stabilizing a few months thereafter but dropping again, bottoming out at about $26 in January 2016. If this sounds familiar, it should. Only a few years earlier, in July 2008, at the tail end of the boom that preceded the financial crisis, oil prices peaked at about $140 per barrel. By year’s end, oil would cost just $33 per barrel. There’s an important distinction between the two downturns. In 2008, prices plunged because of a decrease in demand, and in 2014, they fell because of a surge in production. But if the causes were different, the outcomes were the same: Oil-producing countries languished. Most responsible for the new oil on the market was the United States. Harnessing technologies that had never really been cost-effective enough to use en masse, U.S. producers tapped into vast shale deposits throughout the country and, in doing so, accounted for nearly 60 percent of the increased global supply of crude oil between March 2012 and January 2016. The rest came from Persian Gulf nations, which were trying to “gain market share” – i.e. put the upstart shale producers in the U.S. out of business. The strategy worked for a time. Some debt-laden U.S. companies did, in fact, file for bankruptcy, but others began to research and invest in more cost-effective technologies, which would eventually bring the break-even price of oil down for shale producers. Now, prices have fallen again. They peaked at $86 in 2018 but ended the year just below $51 (though they recovered slightly late last week to $57). This isn’t as severe a decline as it was in years past, but it’s enough to make oil-producing countries worry how long the downturn will last – and what kind of political pressure it will bring to bear. It’s especially concerning now that the world is approaching the end of a business cycle and moving toward a recession, one that will decrease demand, lower the price of oil and call into question how much money investors are willing to invest and how cheaply companies can borrow money. Many countries will stand to benefit from low oil prices. Those that depend heavily on imports – especially countries whose economies are growing – will be able to fuel themselves more cheaply than they once did. The following analysis will map out how major economies will fare in 2019. Economically, China is in a tough spot. It’s trying to deflate a debt-fueled property bubble without generating popular unrest. 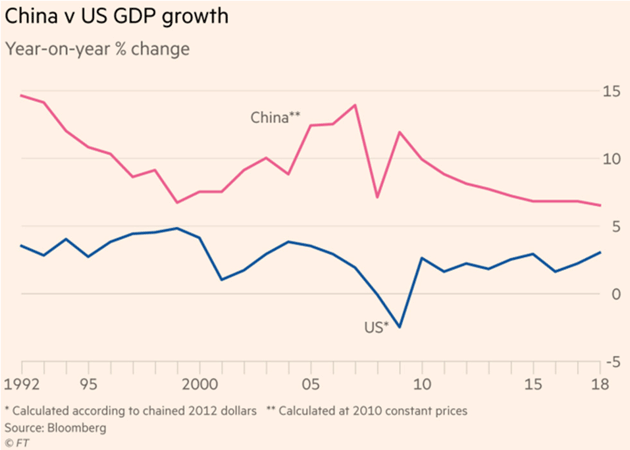 The economy is still growing, albeit slowly by Chinese standards, and so long as it grows, it will need to import massive amounts of oil to fuel manufacturing and industry. (China is the largest importer of petroleum and petroleum-gas in the world in terms of dollars, at $211 billion, or slightly less than 2 percent of gross domestic product.) Beijing will take whatever break it can get, and lower oil costs certainly fit the bill. Like China, India is a developing country with a growing economy, whose citizens are slowly getting used to a better quality of life. But unlike China, India’s economy is less dependent on exports, construction and debt, and so it boasts a slightly different energy profile. About 60 percent of India’s economy, for example, is driven by household consumption. It now consumes about 4.7 million barrels per day but produces less than 1 million bpd of its own. 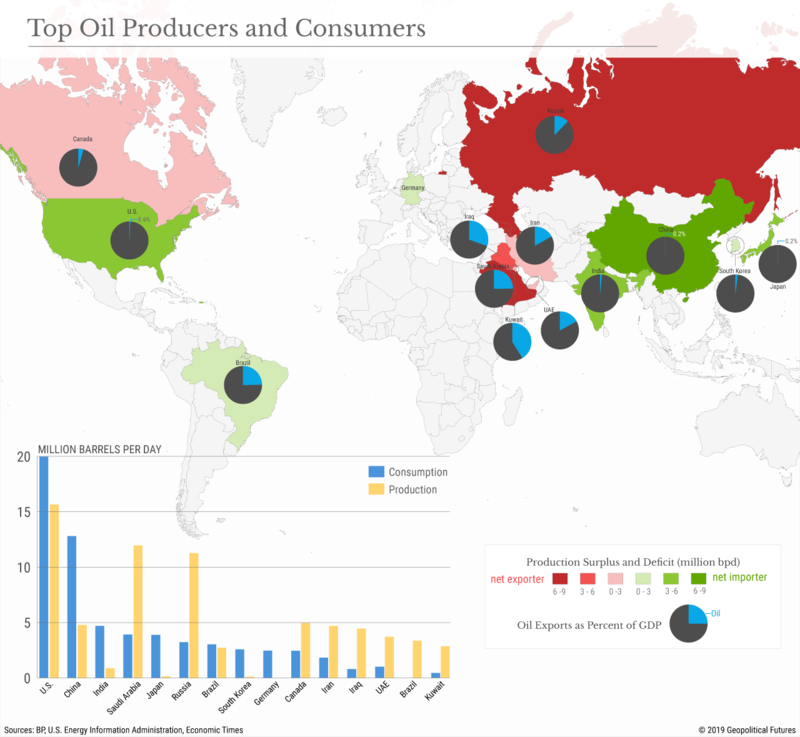 India fills the gap primarily with Middle Eastern oil. In dollar terms, India’s petroleum imports amounted to around $99 billion in 2017, equivalent to approximately 3.8 percent of its GDP, a much larger share of its economy than China’s. Put simply, this means that India spends more on foreign energy relative to the size of its economy than does China. Cheaper oil would help lower costs for energy-dependent businesses as well as consumers, thereby reducing some limits to growth that it could face in the coming years. Japan, too, produces almost no oil domestically and therefore depends on foreign sources of energy. In 2017, it consumed approximately 3.9 million bpd, almost all of which came from abroad, mostly from the Middle East. But Japan has a developed economy, which means that its foreign energy needs are not likely to grow as much as India’s or China’s in the coming years. In fact, Japan’s oil demand actually shrank over the course of 10 years, from 4.9 million bpd in 2007. Since its GDP is also much larger ($4.9 trillion), its oil imports in dollar terms – approximately $117 billion (or 2.4 percent of GDP) – are smaller than India’s relative to the size of its economy. Japan may spend comparatively less for oil imports, but since it has to import all of them, lower prices mean the government can spend more in other areas of the economy. Given all the challenges to the Japanese economy, however, this benefit is likely to be moderate at best. Saudi Arabia is highly dependent on oil exports. Its exports of petroleum and petroleum-gas – about $170 billion – account for approximately 25 percent of its GDP. However, of the nearly 12 million bpd of oil that it produced in 2017, it also consumed nearly 4 million bpd, which means that the oil industry – exports plus domestic sales – accounted for an even larger portion of its economy. Still, these figures understate the importance of oil to Saudi Arabia’s economy and its political regime, since non-oil industries are often indirectly tied to oil production. For example, some of Saudi Arabia’s highest earners, and therefore those who have the most to spend, work for state-run oil giant Saudi Aramco. Though Saudi Arabia’s government was able to grow non-oil revenue from 2012 to 2017, the slump in oil prices beginning 2014 caused its budget to shrink from $330 billion to $185 billion. This is no small matter for Saudi Arabia, which relies on state-provided subsidies to maintain political order and prevent anti-regime sentiment. There are already signs that Saudi Arabia may need to cut prices in 2019. On Jan. 2, four oil refineries responding to a Reuters survey said they were anticipating that Saudi Arabia would need to reduce the price it charges for heavy and medium crude grades sold to Asia. As prices decline, Riyadh will find it difficult to allocate enough funding toward the social subsidies that keep unrest in check. Saudi Arabia is trying to save itself essentially by doing what it did in 2014: cut production enough to drive some shale producers out of business, then raise production again. In December, OPEC and Russia agreed to cut oil production by 1.2 million bpd (800,000 bpd of which came from OPEC), and on Jan. 3 a former Saudi Aramco official claimed that OPEC may cut even more (over 1 million bpd in total) by the end of the month. But with current crude oil prices at approximately $57, Saudi Arabia has a long way to go. The International Monetary Fund estimates that Saudi Arabia’s break-even point (the price required to maintain a balanced budget) in 2018 was approximately $85 per barrel. It believes that will decline to $73 per barrel in 2019. Russia depends less on oil than Saudi Arabia does relative to its total economy. In 2017, it exported approximately $195 billion in petroleum and petroleum gas, which amounts to approximately 12 percent of its GDP of $1.6 trillion. (Note that in our review of the Russian economy published in 2017, revenue from the oil and gas industry, according to Russian sources, amounted to 8 percent of Russian GDP. The discrepancy could be due either to the different sources or to variations in the strength of the ruble.) It’s little wonder that in 2018, Russia produced more oil – more than 11 million bpd – than it ever had before. But as in Saudi Arabia, dependency comes at a cost. In 2016, 36 percent of the Russian federal budget came from oil and gas revenue (about 17 percent of its consolidated budget). With real wages stagnating, Putin’s approval ratings falling and pension reform fueling discontent with the government, the threat from lower oil prices in Russia will quickly become political. Iran is under pressure from every direction. It’s facing a more concerted effort by regional adversaries to reverse the gains it made when it fought the Islamic State, and it’s reeling from U.S. sanctions at a time when its economy was already precarious. Low prices couldn’t come at a worse time for Iran, which like so many of its neighbors needs to sell its oil to survive. Iranian financial figures are notoriously difficult to interpret, but according to U.N. data, Iran exported approximately $74 billion in oil in 2017. The World Bank estimates that in the same year its GDP was approximately $440 billion, meaning that oil exports accounted for 16 percent of its GDP. In 2017, Iran exported between 2.4 million and 2.8 million bpd of oil (its total production was 4.6 million bpd), but some believe that with the resumption of sanctions this figure will fall to 1 million bpd. Low oil prices would add insult to injury, placing an even greater strain on a regime that’s struggling to pacify a citizenry frustrated with the rising cost of living and gradual elimination of subsidies in exchange for ever more defense spending. It’s difficult to gauge the extent to which low oil prices would hurt the U.S. There’s no question that some U.S. shale oil producers would suffer. Locations with higher break-even points would need to shut operations, and the upfront capital needed to explore the reserves at new locations would be more difficult to acquire. But the U.S. isn’t a petrostate. It may have exported about $123 billion in oil in 2017, but that amounts to only about 0.6 percent of its $20 trillion GDP. But, considering the U.S. is the largest consumer of oil in the world, lower prices could be a good thing. When consumers pay less for oil, they have more to spend elsewhere, right? Well, maybe not. A 2016 article from the Brookings Institute showed that the boost to consumer spending resulting from the 2014 decline in prices was equal to the decline in investment in the fracking industry that resulted from lower prices. In other words, there was no net impact on the economy. U.S. oil production in 2019 is similarly difficult to predict. The U.S. Energy Information Administration expects production to increase, and a lot of new transport infrastructure that will come online in 2019 will ease some of the current bottlenecks to production. Yet if OPEC production cuts prove ineffective and prices stay low for too long, the returns may not be there to keep producing at current levels. Either way, despite the U.S. recently overtaking Saudi Arabia and Russia to become the largest producer of oil in the world, the total impact of lower oil prices on the U.S. economy will be small. Some Americans in the oil industry may lose their jobs, but the risk of countrywide unrest is low.